In the present study, the concentrations of aluminium, arsenic, copper, zinc, mercury, iron, cadmium and lead have been measured in sediment and in dwarf eelgrass Zostera noltii, collected from Sinop coast of the Black Sea, Turkey in 2013. Concentrations of Al, As, Cu, Zn, Pb and Fe were generally higher in sediment than those in dwarf eelgrass. Cd concentrations, however, were higher in the dwarf eelgrass samples. Hg was below the limit of detection (<0.05 mg/kg dry wt) in dwarf eelgrass, and it was detected mean 0.02 mg/kg dry wt. in sediment. Cd had the highest CF mean and As showed the lowest CF value. It may be concluded that dwarf eelgrass is able to accumulate the heavy metals from the marine environment and is suitable as bio-indicator to assess the fluctuations in metal pollution in the Black Sea. Al: Aluminium; As: Arsenic; Cu: Copper; Zn: Zinc; Hg: Mercury; Fe: Iron; Cd: Cadmium; Pb: Lead; ICP/MS: Inductively Coupled Plasma-Mass Spectrometer; CFs: The Concentration factors; EC: European Community; MSFD: Marine Environment Policy Marine Strategy Framework Directive. The coastal area is regarded as the geographic area of interaction between terrestrial and marine ecosystems, which are of vital importance for the survival of organisms. Studies on heavy metal levels in coastal areas involve monitoring a series of heavy metals in seawater, sediment and marine biota [1,2] which are used for environmental assessment. Heavy metals levels in marine organisms are higher than those in other constituents of marine environment. Heavy metals are regarded as persistent and harmful pollutants of marine environment because of their toxicity. Because their ability to concentrate heavy metals from their habitat and their ecological significance, there is a clear tendency to monitoring marine organisms [3,4]. Farrington et al. pointed out that two main reasons for assessing the status of chemical pollution in coastal areas were: to protect human health and estimate the exposure via the route back to man to protect valuable living natural sources . Thus it was reasonable to assess for an organism to provide an initial assessment of bioavailability. Phillips  indicated that there should be a simple relationship between heavy metal concentrations in the marine environment and in the bio-indicator species . The Black Sea, an enclosed system encompassing the largest anoxic basin on the world and isolated environment, has always been regarded as legitimate dumping grounds for waste. However, the content of contaminants is now so great that pollution mainly affect on the coastal waters of the Black Sea. Sources of pollution in the Black Sea include dumping, pollution from rivers, contamination from air pollution, shipping activities and occasional accidental spills of toxic chemicals . Pollution with heavy metals in the Black Sea has seriously increased European Community (EC) [7,8] attention and under certain environmental conditions, seagrass may accumulate high levels of heavy metals from the sediment. Seagrasses are marine angiosperms that colonize in shallow coastal habitats, unconsolidated bottoms of most coastal areas and support the production of living marine resources including commercially important fish and shellfish species [9,10], being primary producers may be used as initial bio-indicator to heavy metal monitoring in the marine coastal areas . The reduced flow regime inside seagrass canopies diminishes sediment resuspension . They also develop a web of roots that binds the sediment, and stabilizes it  and may be suffered by fishing activity, polluted bilge water and coincidental spills and polluted by antifouling compounds . Thus seagrass in contact with sediments may accumulate metals both from solution and sediment. Nutrient loading from runoff and scarcity of water quality from sedimentation, coastal development and squandering disease may be resulted in local declines of Z. Noltii . Several researchers subsequently have shown that the use of seagrass as a bio-indicator of heavy metal contamination [11,15-18]. Zostera beds are important habitats for many species, including hydroids, bryozoans, crustaceans, polychaete worms, gastropod molluscs and fishes . Therefore they are considered a valuable component of coastal ecosystems because of the identification of different ecological functions, services and resource and are increasingly protected by law in many countries . The consequence of seagrass can attain source executive with progress of denaturalizing ecological states caused by water pollution . Duarte  drawn attention that seagrass seems to be quite resistant to pollutant by organic and heavy metal. The present study assessed concentrations of Al, As, Cu, Zn, Hg, Fe, Cd and Pb measured by ICP-MS in sediment and the dwarf eelgrass Z. noltii, collected from the Black Sea coast and evaluated the utility of this species as a biomonitor. There was no available data on the heavy metal levels by Z. noltii from the Black Sea coasts. The sediment and Z. noltii samples were collected monthly from May to August in 2013 from Akliman at Sinop coast of the Black Sea, Turkey. Akliman is located near the mouths of rivers, which carry industrial discharges of pollutants to the offshore waters . There are also local fishing activities and tourism activities. The location of sampling station is shown in Figure 1. Healthy dwarf eelgrass Z. noltii were collected at 1-5 m depth in the upper-infra littoral zone of Akliman at Sinop coast by diver and washed thoroughly with ambient water to remove sediment, debris and associated fauna. Cleaned samples were transported immediately to the laboratory in an ice box. Leaves, roots and rhizomes of Z. noltii samples were dried to constant weight at room temperature for 2-3 days and were ground by a mortar to obtain a homogenous powder then placed in acid washed sealed polythene bags and kept at 4°C for metal analysis. Sediment samples were collected in PVC cores by divers, in the vicinity of the Z. Noltii at a depth of 5 meters or less. The core samples obtained was 10 centimetres in length with a diameter of 4 cm. After the cores collection, all of them were sliced 5 cm interval with the sediment extruding device. The sediment slices were stored in cleaned polyethylene bottles with on ice to keep cold and transferred to the laboratory. They were frozen at -21ºC in a deep freezer until analysis. Biota analysis: Metal analysis of the dwarf eelgrass samples were performed using m-AOAC 999.10- ICP/MS (Inductively Coupled Plasma – Mass Spectrometer) method by accredited ÇEVRE Industrial Analysis Laboratory Services Trade Company (TÜRKAK Test TS EN ISO IEC 17025 AB-0364-T). EN 15763 European Standard methods was applied. The limits of detection used for dwarf eelgrass analysis of aluminium, arsenic, copper, zinc, mercury, iron, cadmium and lead were 0.5, 0.05, 0.5, 0.5, 0.05, 0.5, 0.02 and 0.05 mg/kg dry wt. respectively. Sediment analysis: Metal analysis (except Hg) in all subsampling pulverized to 85% passing 200 mesh was performed using 4 acid digestion and ultra-trace ICP-MS method by accredited ACME Analytical Laboratories Ltd. (Vancouver, Canada). Ultra trace Aqua Regia digestion method for Hg analysis was also used by accredited ACME Analytical Laboratories. The average values of duplicates were analysed for each determination. The limits of detection used for sediment analysis of aluminium, arsenic, copper, zinc, mercury, iron, cadmium and lead were 0.02, 0.2, 0.02, 0.2, 0.01, 0.02, 0.02 and 0.02mg/kg, respectively. One factor ANOVAs was used for comparisons between metal concentrations in the dwarf eelgrass and sediment samples. When ANOVA identified a significant difference, a post hoc pairwise comparison of the sample means was performed by the post-hoc test of Tukey (p < 0.05). The Concentration factors (CFs) were performed to know the efficiency of Z. noltii to accumulate heavy metal from sediment and were calculated as concentrations of heavy metals in Z. noltii / concentrations of heavy metals in sediment. Heavy metals in sediment obtained from Sinop coasts where living dwarf eelgrass have been determined. 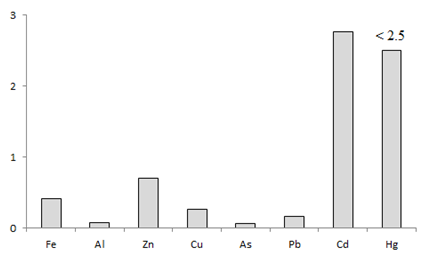 Figure 2 shows the concentration of heavy metals in dwarf eelgrass Z. Noltii and sediment from Sinop coast of the Black Sea. In this study the dwarf eelgrass samples were analysed together with the above (leaf) and below (root-rhizome) sediment tissues. For all eight metals Al, As, Cu, Zn, Hg, Fe, Cd and Pb, there was a significant difference in dwarf eelgrass metal concentrations among the sediment concentrations (ANOVA P<0.05). Concentrations of Al, As, Cu, Zn, Pb and Fe were generally higher in sediment than those in dwarf eelgrass. Cd concentrations, however, were higher in the dwarf eelgrass samples. Hg was below the limit of detection (<0.05 mg/kg dry wt) in dwarf eelgrass, and it was detected mean 0.02 mg/kg dry wt. in sediment. The concentration factors (CFs) were performed to know the efficiency of dwarf eelgrass to accumulate heavy metal from sediment. Low concentration factors of heavy metals are indicative of low accumulation of heavy metals by the dwarf eelgrass Z. noltii whereas high concentration factors of the heavy metals indicate active uptake. Cd had the highest CF mean and As showed the lowest CF value (Figure 3). It may be concluded that dwarf eelgrass may accumulate all the heavy metals from the marine environment. Figure 2: Heavy metal levels (mg/kg dry wt.) in seagrass and sediment from Sinop coast of the Black Sea. Figure 3: Mean bio-sediment concentration factors (CF) in Z. noltii. Many studies are available on the heavy metals research has focused on the accumulation of heavy metals in seagrasses [11,13,15,16,22]. In this study Fe was the highest in Z. noltii and followed Al, Zn, Cu, As, Pb, Cd and Hg. Similarly, Prange & Dennison  found that heavy metal concentrations in leaf and root-rhizome tissues of Zostera capricorni as follows Fe>Al>Zn>Cr>Cu. On the contrary Llagostera et al. found higher metal levels in leaves and roots than those in rhizomes. They also determined higher Cd, Mn and Zn levels in leaves, Fe and Pb levels in roots and Cu and Ni in both organs. Ambo-Rappe et al. showed that Cu and Pb were environmental stressor on the seagrass Halophila ovalis. These authors found that Cu and Pb also reduced the growth rate of this seagrass. Govindasamy et al. have drawn attention that these types of toxicity based on researches provide an ecological point of view the impact of heavy metals. Roots of seagrasses absorb heavy metals from the sediments and may accumulate high concentrations [13,24]. This is unlikely to be the case in this study, because of the metal levels measured in sediments except Cd were always higher than those in Z. noltii. An alternative explanation is that exposure to contaminated sediment may have been stressful in itself, since root-rhizome tissues of the dwarf eelgrass normally below the sediment. Heavy metals are regarded as the most important xenobiotic from the environment because of their tendency to concentrate on aquatic organisms and their toxicity for humans even at low concentrations [1,2]. They enter the Black Sea mainly land-based effluent source [4,25]. As a consequence the Black Sea is affected by a large amount of pollutants including heavy metals through the rivers flowing into the sea, despite severe laws regarding the protection of sea ecosystems. The European Parliament published in the field of Marine Environment Policy Marine Strategy Framework Directive , marine ecological quality, the coastal and open ocean systems, has been developed to protect and restore. Marine Strategy Framework Directive (MSFD) is based on the principle of ecosystem-based management takes into account all pressures of the seas and approaches to the sea regionally. The purpose of the directive in the EU by 2020 is to ensure Good Environmental Status of the seas (GES) including to use seagrasses as indicators to assess ecosystem quality [26,27]. Marbà et al. indicated that the faster growing and shorter-lived Z. noltii is the dominant seagrass species in the Black Sea. Therefore it is important to the use of aquatic species as bio-indicators for heavy metal pollution is widely-used, the dwarf eelgrass being rather used indicators . It is concluded that the dwarf eelgrass Zostera spp. is suitable biomonitor to assess changes in metal pollution in the Black Seacoastal area. Further studies are urgently needed widely in the Black Sea coasts for a better view. This work was supported in the Sinop University for Scientific Research Project; project number SÜF-1901-12-02. Bryan GW (1976) Heavy Metal Contamination in the Sea. In: R. Johnston (Ed. ), Marine Pollution, Academic Press Inc. London, 63(4): 544. Phillips DJH, Rainbow PS (1994) Biomonitoring of Trace Aquatic Contaminants. Environmental Management Series, Chapman & Hall, London. Ober AG, Gonzáles M, Maria IS (1987) Heavy Metals in Molluscan, Crustacean, and Other Commercially Important Chilean Marine Coastal Water Species. Bull Environ Cont Toxicol 38(3): 534-539. Bat L (2014) Heavy metal pollution in the Black Sea. In: Düzgüneş E, et al. (Eds. ), Turkish Fisheries in the Black Sea. Turkish Marine Research Foundation (TUDAV), Istanbul, Turkey, pp. 71-107. Farrington JW, Davis AC, Tripp BW, Phelps DK, Galloway WB (1987) Mussel Watch-Measurements of Chemical Pollutants in Bivalves as One Indicator of Coastal Environmental Quality. Boyle TP (Ed. ), American Society for Testing and Materials, Philadelphia, USA, pp. 125-139. Phillips DJH (1980) Quantitative Aquatic Biological Indicators Their Use to Monitor Trace Metal and Organochlorine Pollution. Applied Science Publishers, London, UK, pp. 488. Official Journal of the European Union (2008) Directives Directive 2008/56/EC of the European Parliament and of the Council of 17 June 2008 establishing a framework for community action in the field of marine environmental policy. Marine Strategy Framework Directive. Official Journal of the European Union (2010) COMMISSION DECISION of 1 September 2010 on criteria and methodological standards on good environmental status of marine waters. 232: 14-24. Fish JD, Fish SA (1996) A student’s Guide to the Seashore. Second edition, Inst. of Bio. Sci, Univ. of Wales, Aberystwyth, England. Borum J, Duarte CM, Krause-Jensen D, Greve T M (Eds.) (2004) European seagrasses: an introduction to monitoring and management. A publication by the EU project Monitoring and Managing of European Seagrasses (M&MS) EVK3-CT-2000-00044, p. 1-95. Prange JA, Dennison WC (2000) Physiological responses of five seagrass species to trace metals. Marine Pollution Bulletin 41(7-12): 327-336. Hemminga MA, Duarte CM (2004) Seagrass Ecology. Cambridge University Press, Cambridge, United Kingdom, pp. 298. Govindasamy C, Arulpriya M, Ruban P, Francisca Jenifer L, Ilayaraja A (2011) Concentration of heavy metals in Seagrasses tissue of the Palk Strait, Bay of Bengal. International Journal of Environmental Sciences 2(1): 145-153. Short FT, Carruthers TJR, Waycott M, Kendrick GA, Fourqurean JW, et al. (2010) Zostera noltii. The IUCN Red List of Threatened Species. Lafabrie C, Pergent G, Kantin R, Pergent-Martini C, Gonzalez JL (2007) Trace metals assessment in water, sediment, mussel and seagrass species-Validation of the use of Posidonia oceanica as a metal biomonitor. Chemosphere 68(11): 2033-2039. Llagostera I, Pérez M, Romero J (2011) Trace metal content in the seagrass Cymodocea nodosa: Differential accumulation in plant organs. Aquatic Botany 95(2): 124-128. Wasserman JS, Wasserman MAV (2002) Cu, Fe, Mn and Zn Cycling in Seagrass (Zosteranoltii Hornemann) Stands from the Arcachon Bay (Atlantic French Coast). Mundo & Vida 3(2): 67-77. Malltezi J, Dini V, Bani A, Sulçe S (2012) Heavy metals in sediments, musses, seagrass and marine water of Saranda Bay, Albenia. Fresenius Environmental Bulletin 21(11): 3249-3258. Fish JD, Fish SA (1996) A Student’s Guide to the Seashore. (2nd edn). Cambridge University Press, UK, pp. 564. Duarte CM (2002) The future of seagrass meadows. Environ Conserv 29(2): 192-206. Bat L, Öztürk M (1997) Heavy Metal Levels in Some Organisms from Sinop Peninsula of the Black Sea. Tr J Engineering and Environ Sci 21: 29-33. Benkhayal AA, El-turki KS (2013) Determination of some Heavy Metals in Sea-grass “Poisdonia oceanica” (L.) Delile of Eastern Libyan Coast “Mediterranean”. J Marine Sci Res Dev 3(4): 135. Ambo-Rappe R, Lajus DL, Schreider MJ (2011) Heavy metal impact on growth and leaf asymmetry of seagrass, Halophila ovalis. Journal of Environmental Chemistry and Ecotoxicology 3(6): 149-159. Tupan CI, Herawati EY, Arfiati D, Aulanni’am (2014) Detection of phytochelatin and glutathione in seagrass Thalassia hemprichii as a detoxification mechanism due to lead heavy metal exposure. Aquatic Science and Technology 2(2): 67-78. Bat L, Gökkurt O, Sezgin M, Üstün F, Sahin F (2009). Evaluation of the Black Sea land based sources of pollution the coastal region of Turkey. The Open Marine Biology Journal 3: 112-124. Borja A, Bricker SB, Dauer DM, Demetriades NT, Ferreira JG, et al. (2008) Overview of integrative tools and methods in assessing ecological integrity in estuarine and coastal systems worldwide. Marine Pollution Bulletin 56(9): 1519-1537. Borja A, Basset A, Bricker S, Dauvin JC, Elliott M, et al. (2012) Classifying ecological quality and integrity of estuaries. In: Wolanski E & McLusky D (Eds. ), Treatise on Estuarine and Coastal Science. Academia Press, Elsevier, Waltham, USA, pp. 125-162. Marbà N, Krause-Jensen D, Alcoverro T, Birk S, Pedersen A, et al. (2013) Diversity of European seagrass indicators: patterns within and across regions. Hydrobiologia 704(1): 265-278. Govers LL, Lamers LPM, Bouma TJ, Eygensteyn J, de Brouwer JHF, et al. (2014) Seagrasses as indicators for coastal trace metal pollution: A global meta-analysis serving as a benchmark, and a Caribbean case study. Environmental Pollution 195: 210-217.